Southwest Greens of New Mexico has the expertise to custom fit artificial turf putting greens to any backyard. During our first meeting, we will go through options that will best suit your backyard while keeping your needs as a top priority. 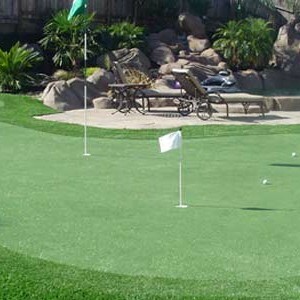 We want your artificial putting green to be perfect, which means fitting it to your backyard terrain and skill level. Our synthetic turf comes in a variety of styles. Different blade lengths, textures and colors are all options to customize your backyard putting green. Artificial turf is also great for practicing those tricky chip shots when you are a bit further off the green. Save Time and Money: An artificial turf putting green simply doesn’t require the type of maintenance and hassle that natural grass does. Your water bill will be drastically lower, and you can spend more time practicing rather than mowing. Long Lasting: Our turf has a life expectancy of over 25 years. The wear and tear that natural grass receives from continuous use is not a factor with synthetic grass. There will be no divots to fill, stroke marks to patch or grass to mow. True Ball Roll: Depending on the time of day and the weather, natural grass plays differently. Artificial grass putting greens look and feel like natural grass, but will always have consistent true ball roll. Weather Resistant: Don’t let rain or dry grass stop you from practicing. Our turf is weather resistant, which allows you to practice without worrying about mud spots or dead grass. Southwest Greens of New Mexico can install the putting green that you’ve always wanted, customized for your backyard. To get your free consultation, contact us today!